If you’ve been following my little blog, my Instagram or my Facebook page for a while you’ll know that I’m a coffee lover. Big time. 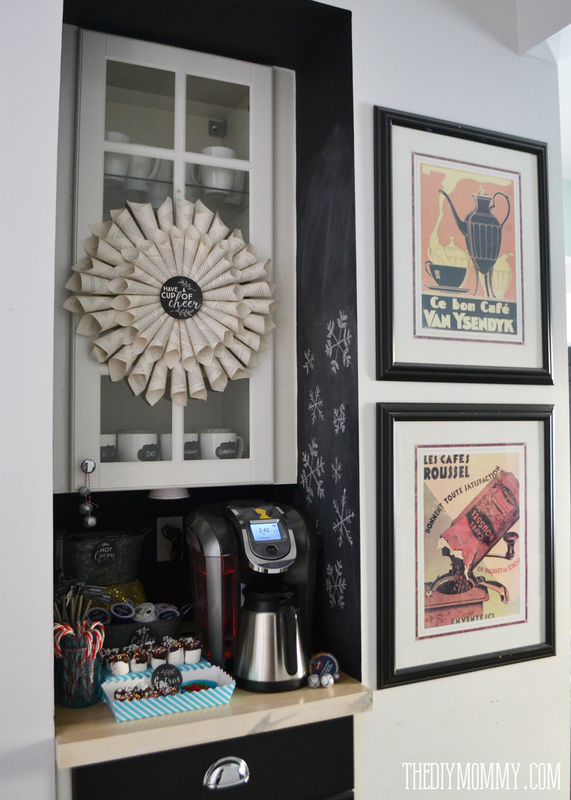 I can’t get enough DIY vanilla lattes, and when we designed our home we built a little nook just for me and my coffee. I decked it out for Valentine’s Day earlier this year (and painted the whole thing with chalkboard paint on a whim), and now I’ve decorated it for our Christmas company this year. 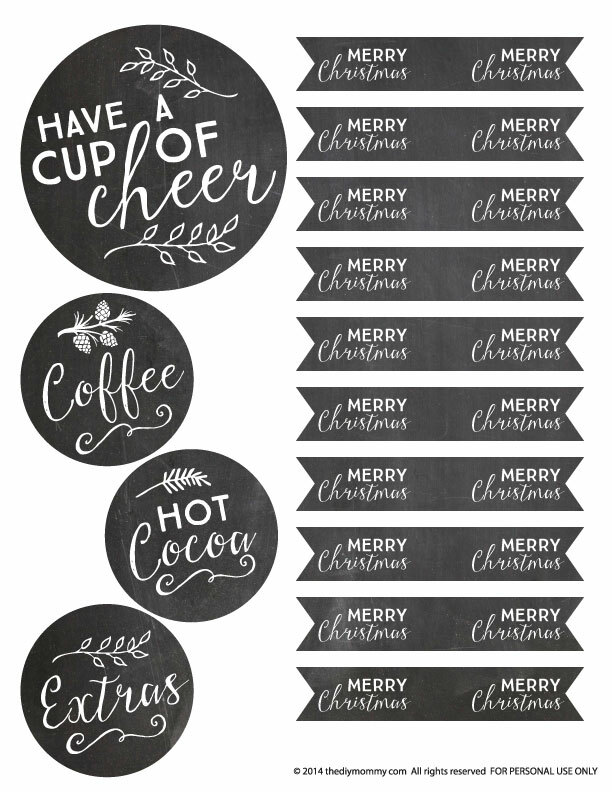 I simply can’t quit chalkboard inspired things, so hold on to your seats and get ready for lots of black, white and chalkboard-ness in this year’s Christmas coffee & hot cocoa nook. Also, I’ve got a treat for my Canadian readers! Scroll down to the bottom of this post to enter to win a new Keurig 2.0! 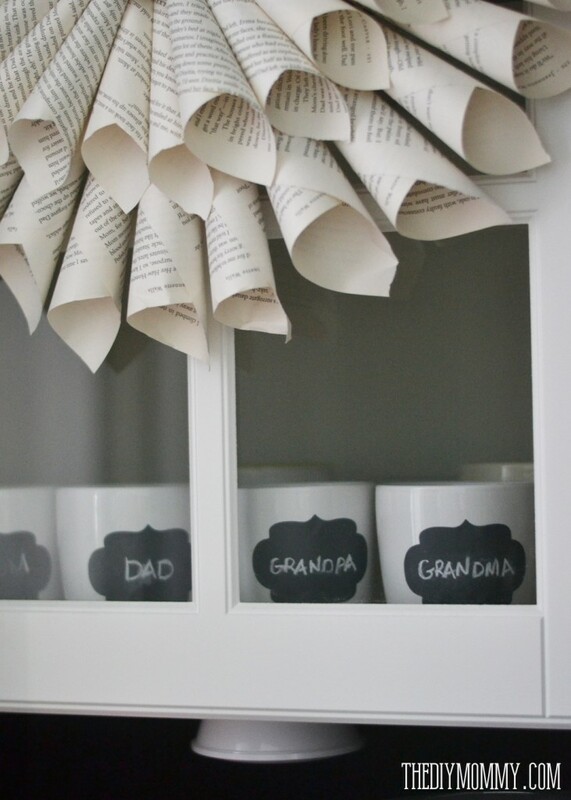 I’m loving the whimsical look of this nook, and the book page wreath really takes the spotlight. I finally made a book page wreath! I’m about 3 years behind the times in blogger world with this, but boy do I still love it. Plus: it was easy and free! I cut a circle out of cardboard, ripped pages out of a book, rolled them up, glued them together, and then glued them onto the circle. 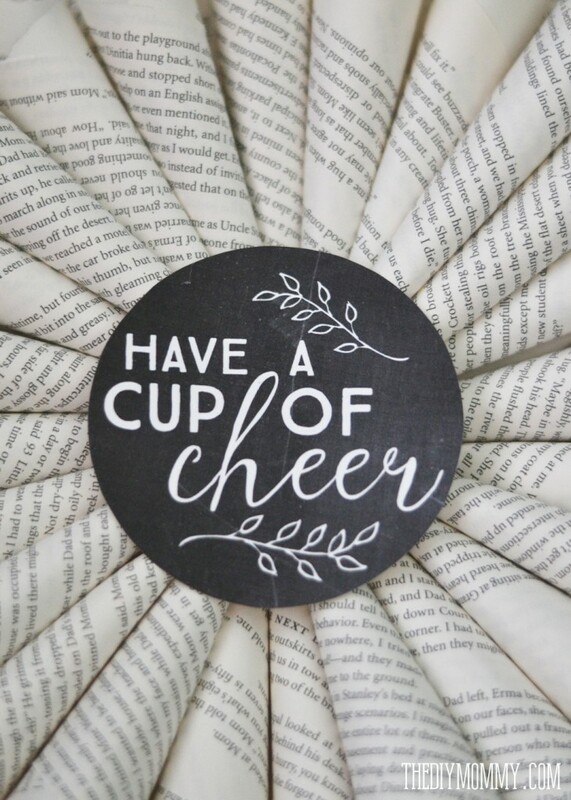 The “Have a Cup of Cheer” center is gently taped on so that I can change it seasonally (this is a free printable that you can download later on down this post). 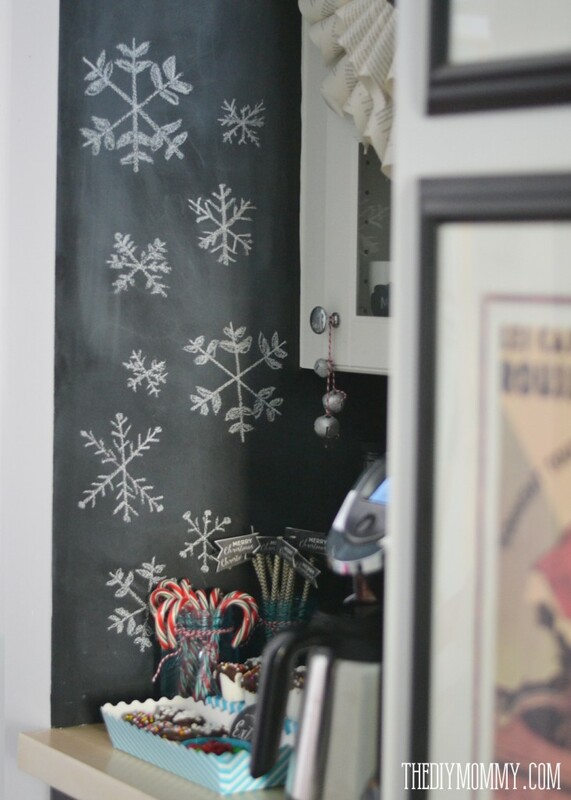 I drew some snowflakes onto my chalkboard walls for added Christmas spirit! Last week, my girls and I had a fun afternoon of dipping marshmallows in melted chocolate chips and then sprinkling them with sprinkles. 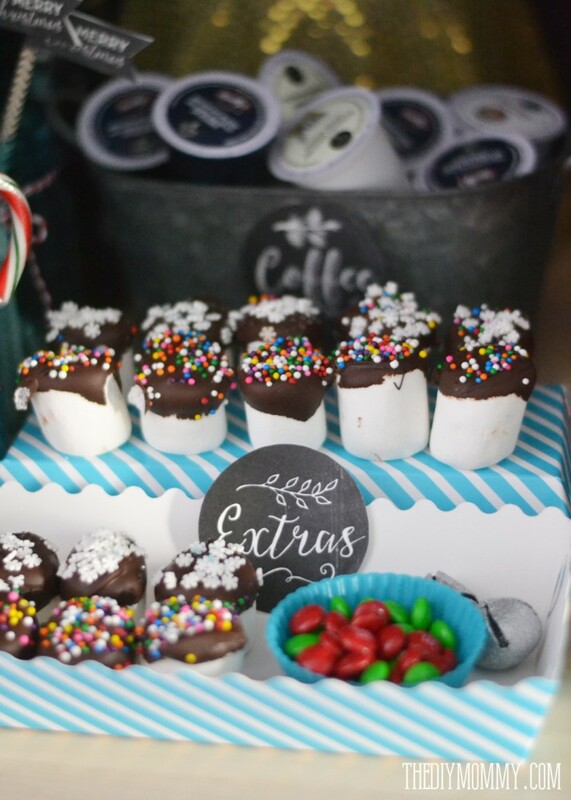 These make a cute addition to hot chocolate (or to eat on their own). I set them in little trays with M&M’s. My lovely Keurig 2.0 is the star of the coffee and hot chocolate show here in my nook. It can brew a whole carafe of coffee, which I can leave in my stainless steel insulated carafe (this is sold separately) for my guests to easily enjoy. The Keurig 2.0 system can also brew a coffee, tea or hot chocolate in a single serving size so that my guests can choose which drink they’d prefer and make it on demand with the easy-to-follow light up screen. 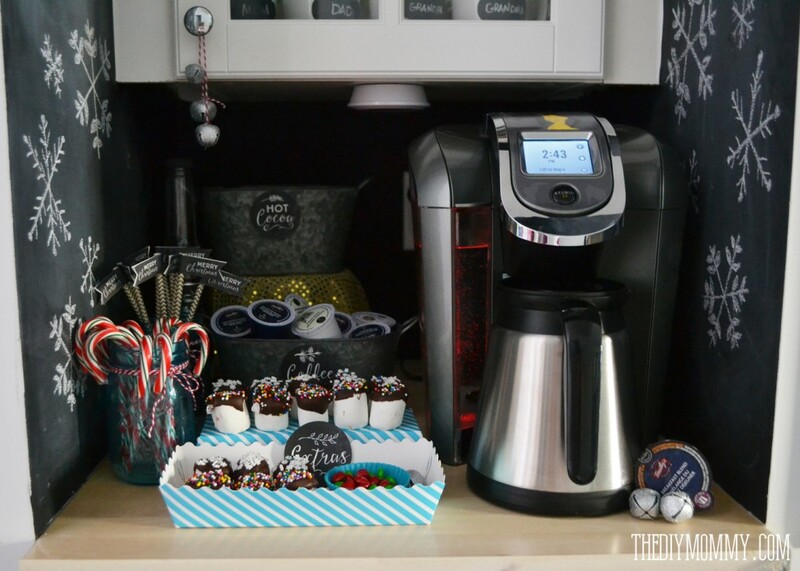 Keurig 2.0 Brewing TechnologyTM reads each lid to deliver a perfect beverage every time AND the new Keurig 2.0 brewer has new features like strength control so that my guests and I can brew a stronger cup of coffee. 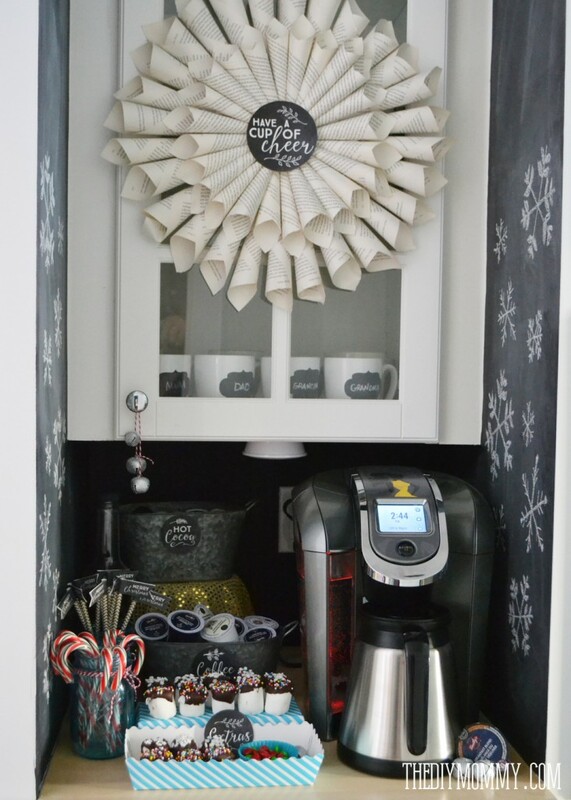 I put some chalkboard labels on my simple white mugs in the nook cabinet so that my Christmas guests can label their mugs and not lose them. 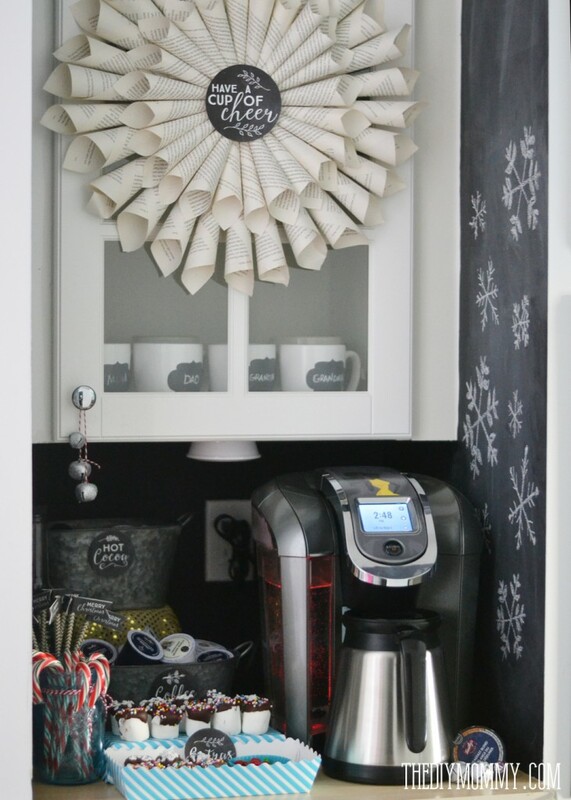 The nook is also outfitted with candy canes and “Merry Christmas” stir sticks in blue mason jars, tins of coffee and hot chocolate K-cups, and some fancy coffee syrup. 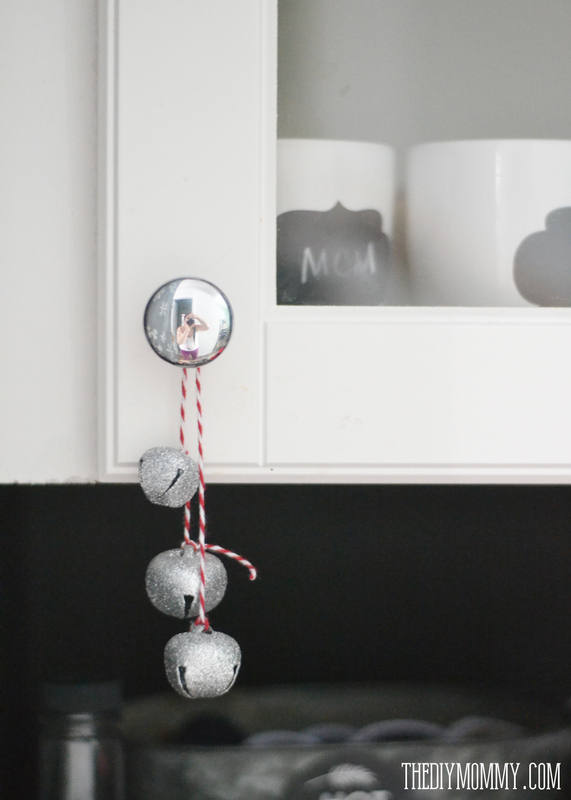 I tied some glittery silver jingle bells with baker’s twine from the cupboard knob. Every Christmas vignette needs glitter. Yes, it does. Our coffee nook is in between our kitchen and our formal front room, so it’s a great spot for our Christmas guests (and… cough, cough…. me) to grab a hot drink and relax in either space. Care for a hot cocoa and a sprinkled marshmallow? Now it’s time for a fantastic giveaway of one of my favourite things! It’s the my final giveaway on my blog for 2014, and this is a great one. 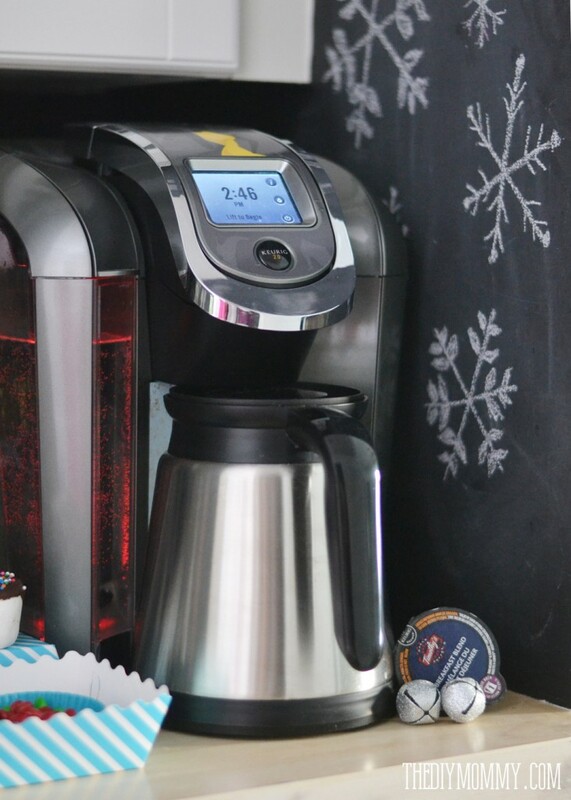 YOU can enter to win your own Keurig 2.0 system. I think you’ll love it just like I do! Between the lit screen, the carafe brewing capabilities and the strength control – the Keurig 2.0 has it all for coffee and hot drink lovers. Please use the widget below to enter to win a Keurig 2.0 for your very own! The contest is open to Canadian residents only this time, and it ends on Sunday, December 21st at 11:59PM MST. The widget below contains the rest of the rules. Good luck! Disclaimer: This post is sponsored by Keurig Canada. As always, the opinions expressed here are my own. Totally love it!!! As always. Thanks for another fab giveaway! I LOVE your house! This is too cute, especially the wreath and chalkboard wall! My favorite drink is Starbucks new Chestnut Latte! yum! Love it! And my favorite drink is coffee with eggnog 🙂 low cal, it is not, but boy does it make me feel jolly! Beautiful!! So jealous of the coffee nook!! I want one!! My favourite Christmas drink in mulled cider! Love your nook. I like A Gingerbread latte. If I’m being all fancy. I like my coffee with a bit of Baileys at Christmas!! All your decor is gorgeous! Thanks for the inspiration on that wreath! Just drooling over here! haha 🙂 Thanks for the chance at the giveaway! Pepperment hot chocolate is my favorite hot drink. White hot chocolate with a splash of Baileys! I would love a nook like that! love my coffee! love your little nook! I love Cafe Mocha or hot chocolate this time of year. I love coffee with some Bailey’s at the holidays! My favourite kind of hot drink at Christmas time is hot chocolate. I love Hot Toddy’s. Yummy yum. My favourite is hot cocoa. Christina! 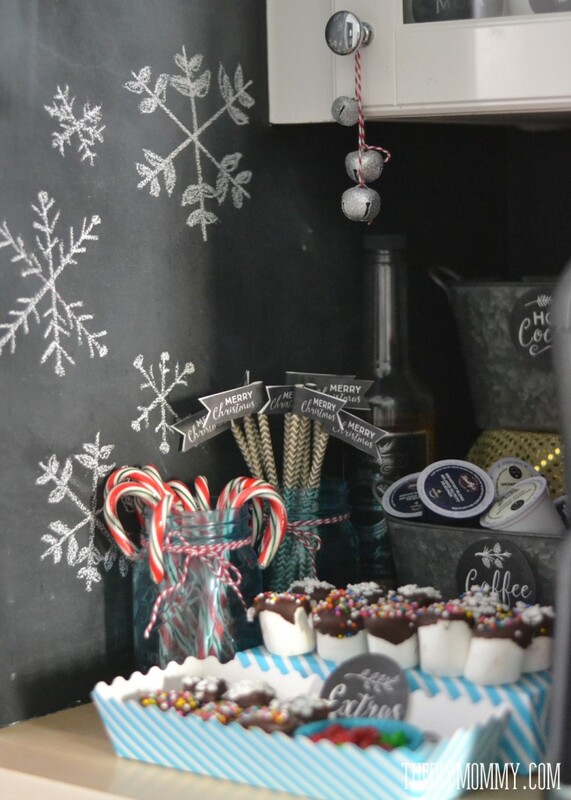 Your coffee/hot chocolate station is to DIE for ! I love it! Can you come over and make one of those for me!?!? My favourite hot drinks are chai lattes and mochas. Fingers crossed! I’d love to win! I love white hot chocolate. You had me at coffee and black and white. I mean really, the station is SO cute! You really put so much thought in all of the details! My fave drink? A simple latte. Yum! Coffee and Baileys! ☺️ Thanks so much for the giveaway! Happy holidays! I am loving the chestnut praline latte from Starbucks! Before that though, I always loved hot chocolate during the winter/holidays. I love a caramel machiatto (oh, I hope I had the right spelling there lol ) . I also love white hot chocolates! MMMmmm … thank you! Hot chocolate 🙂 but drink more coffee. Love gingerbread latte at christmas time! Love my keurig hope to win a new one. Love a nice hot chocolate!! I love vanilla bean hot chocolate! Anything with peppermint in it!!! A simple coffee and Bailey’s for me! Love a good hot white chocolate! Candycane green tea, regular coffee or a mix of white and dark hot chocolate powder! I am a coffee lover as well and this time of year a wee bit of Bailey’s in it is my drink of choice. My favorite hot drink during the holidays has to be hot chocolate! my boyfriend makes the BEST homemade hot chocolate for me and it is just the most amazing thing ever! My favorite drink around the holidays is coffee with peppermint! 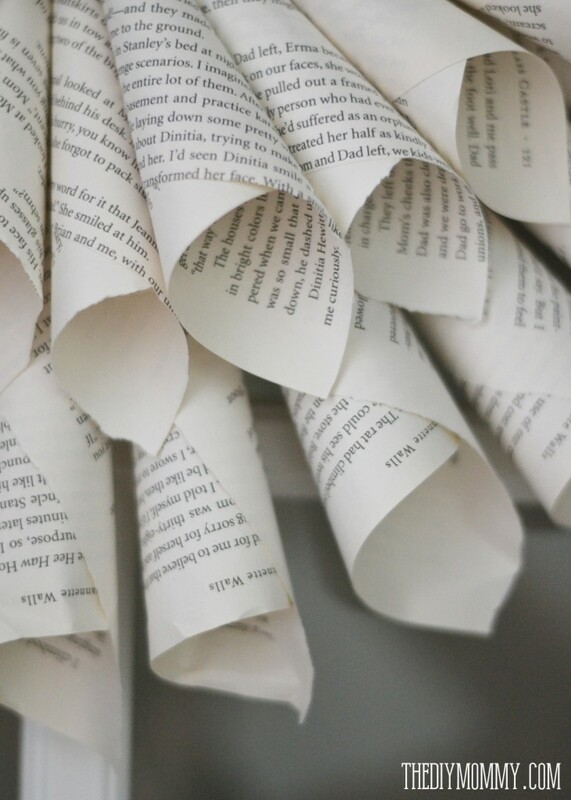 I LOVE your book page wreath! I have been wanting to make one, but have not gotten around to it yet! I really hope that I get this giveaway! I am dying to try The Infamous Keurig! My fave drink is hot cocoa btw!